One thing I have learned from my horrible experiences: most people are not strong enough to learn about painful truths. If you can’t handle reality, I recommend @CuteEmergency. For many years, I have wished I were dead, but that is not the same as considering suicide. But after my father, Dan Hogan, cruelly broke his promise to help me, my suicidal thoughts increased. Plus, in the last few weeks, almost everyone who has read about my worsening life has refused to do anything: many people read my plea to test something on my website, for example, but not one person helped. Consequently, my suicidal thoughts and feelings are much stronger and more common than usual. When I write a new post, most people learn about the post through Facebook. (People could choose other ways to receive notifications, but most people choose to sell their personal information to Facebook.) My Facebook Page is Liked by 182 people. Starting 6 April 2018, I wrote many posts, but Facebook only showed them to a few of the 182 people. The following screenshot is in reverse chronological order: the post from 6 April 2018 is at the bottom. “Reach” is how many people who Facebook showed the post to. If I want to “promote” my post so more people will see it, I can pay the low price of $91—to reach the people who already Like my page. Promoting a post only puts the post in Newsfeeds, so Facebook has a special deal: for only $20 per day, I can get up to one click a day. I am desperately trying to raise enough money to break the vicious cycle of poverty, homelessness, and illness. Facebook demands from me $20 per day or a flat $91, but I only have $80.29. 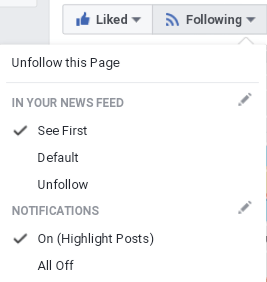 To reach the people who already Like my page, Facebook demands I give them all of my money. That is extortion. To help spread this specific post, please do one or more of the following: Like this post on Facebook, comment on this post on Facebook, share this post on Facebook, and share this post everywhere you can. To break Facebook’s power over our future communications, do one or more of the following. 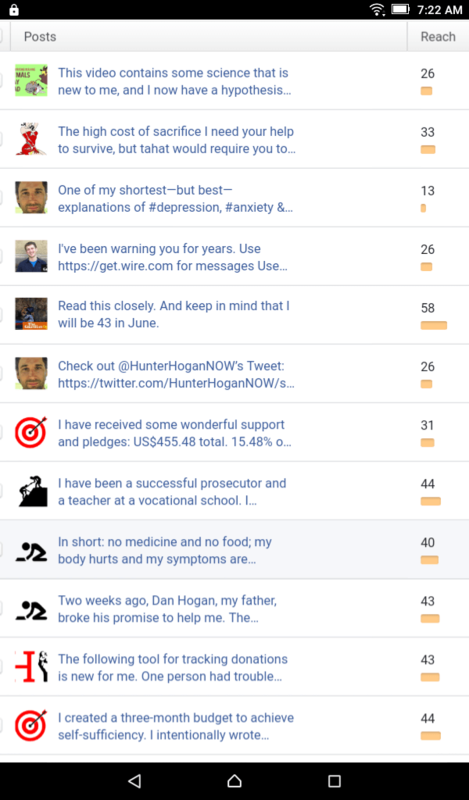 Enter your email address to receive an email when I post on HunterThinks.com. The following might also have notifications, but I’m not digging for the links: Diigo, Plurk, Scoop.it, Sett, StumbleUpon, and Xing. My father, Dan Hogan, sent me multiple messages over many months, each one promising he would help me only if I found a housing-first program. Because of years of his abuse, I blocked all of his email addresses a long time ago. 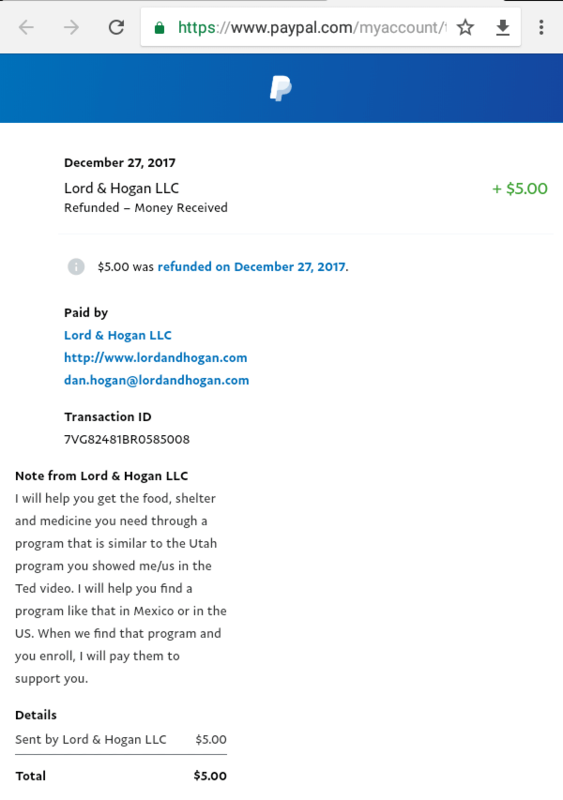 So, he used PayPal to send me $5 and make his promise. I satisfied his demands, and he broke his promise. I was devastated. I’m still hurting. After my father, Dan Hogan, cruelly betrayed the trust I gave him and violated my boundaries, I created a three-month plan that has a high probability of success. I have written about it, and dozens of people have read about it. But most people are only interested in reading about my soap opera life—they do not want me to recover. 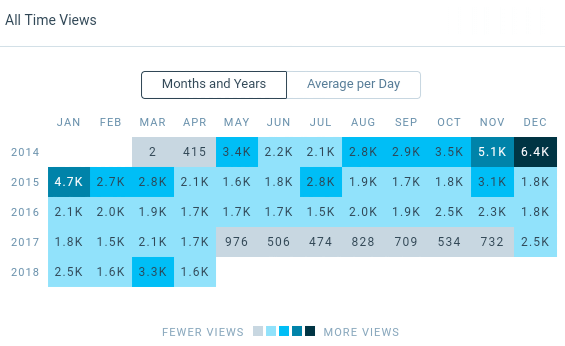 On this table, you can clearly see that website had the most views in December 2014. The most page views I had in a single day was in December 2014. What happened on 22 December 2014 that caused so many people to read my website? I spontaneously tried to kill myself. Hundreds of people read the soap opera. Some people wrote to me. Very few people helped me. Fortunately, a few people have helped me, or I would be back on the streets, without food, and without medicine. I’ve only have 19.85% of what I need. If I create a three-month plan to heal, but I spend the entire three months begging for money, then I can’t spend time healing: the plan fails. I’ve already spent one-sixth of my time begging—and none of my time healing—and I’ve reached one-fifth of what I need. Unless something changes, I won’t heal, and I will continue to face crises. Instead of only feeling and thinking, “I wish I were dead,” I have felt and thought, “Maybe I should kill myself.” I don’t know what else to tell you about this. Destroy Facebook’s stranglehold on my communications, as I described above. Create a fundraising campaign that works. I need help to get back on my feet. You can significantly transform my life with one donation per month for three months. Select what you can afford: the equivalent of you buying for yourself dinner-for-two each week, or one movie ticket each week, or a cheap lunch every week, or a 2-liter soda each week. To donate one time, go to www.PayPal.me/hunterhogan. If you sent me money each month, how would it affect your life? If you can face one of these hardships, please help me to heal. If you were to spend an extra 47¢ each day, you would need to cancel Netflix and endure the humiliation of reading books. You would be a fool to cancel your gym membership and exercise outside just to send me $1.93 per day because your reduced exercise will shorten your life expectancy and you might be struck by lightning while exercising outside. Only the most noble and extraordinarily tough person would downgrade their Starbucks triple-shot blonde, grande, four-pump half-vanilla half-hazelnut, almond milk, extra hot macchiato ($8.12) to a venti drip coffee ($2.79). Actually, $999.99 per month would be a burden for almost everyone. How far will/can you go so I can survive this nightmare and I can return to helping other people?